It has been half a year since I started this recipe blog, and I must admit that there are times when I feel that I'm not doing good at it. Yes, I love to cook...and being able to share my recipes with other people gives me an amazing feeling of satisfaction. Meeting new friends even makes it more rewarding! But most of the time, I feel so bad when I find myself running out of time to reply to your comments and be a good follower to the bloggers that I'm supposed to follow. I must say that I appreciate all your comments, but as much as I want to, I really don't have enough time to email you back one by one to thank you. I am so sorry for that! But please know that you, my dear followers, mean a lot to me! I am so thankful for all your comments...and they are actually what motivates me to carry on. 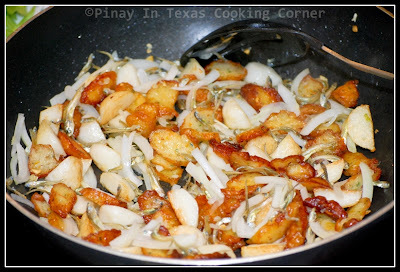 Knowing that there are people actually reading my blog inspires me to keep on cooking Filipino and non-Filipino dishes that I can share in this blog. Though my other tasks and responsibilities as an SAHM don't allow me to show how thankful I am to all of you, I want you to know that I really am! From the bottom of my heart, I want to thank you all for your continuous support! 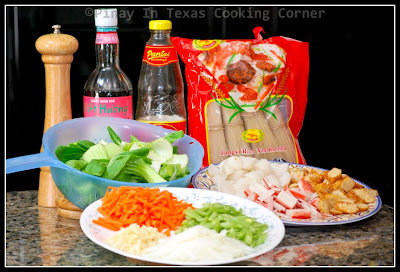 You are the reason why Pinay In Texas Cooking Corner is here...and I wish that you all stay with me in this journey! 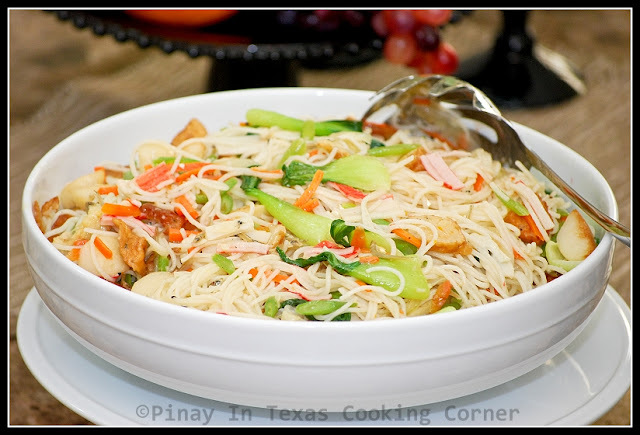 The procedure of cooking this dish is almost similar to the other noodle dishes I've shared with you like the Pancit Canton and Pancit Bihon. The difference is the kind of noodles used. 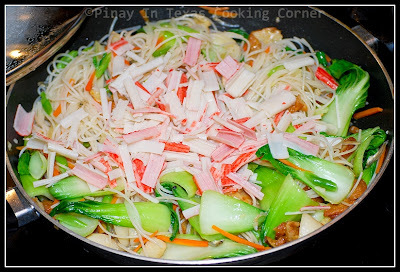 With this one, I used Jiangxi Rice Vermicelli, a kind of noodles that isn't common in the Philippines. It is actually from China. It was only when we got here in the US that I first had the chance to try it. 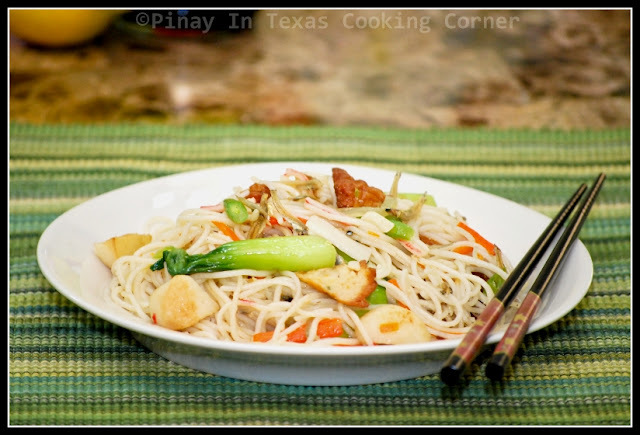 I like it in soup, and this is actually the first time I tried cooking it the way I cook Filipino pancit. 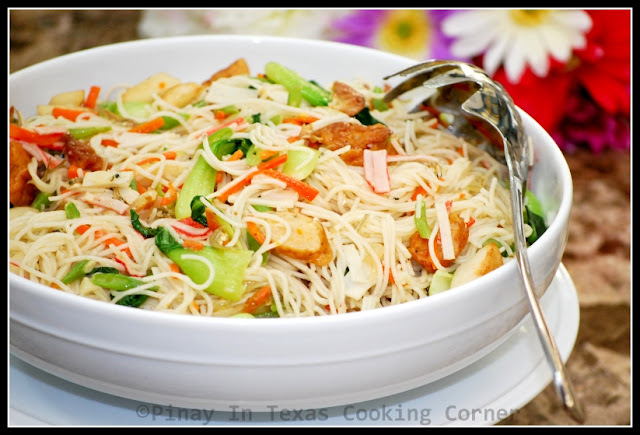 Jiangxi rice vermicelli is opaque like the Filipino Bihon which is our version of rice sticks, but is thicker. Though it's vermicelli, it's not the same as the common vermicelli in the Philippines, called sotanghon which is bean thread noodles. I love the soft texture of Jiangxi rice vermicelli especially when properly cooked. If it's your first time to cook this kind of noodles, better cook it separately, according to package directions, instead of what I did. I cook it in the sauce just like how I cook Filipino Pancit. I like cooking noodles this way so the noodles could absorb all the juice from the other ingredients, unlike when just mixing it with the rest of the ingredients after cooking it separately. 1. 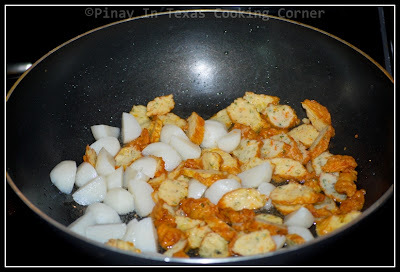 In a wok over medium heat, fry fish balls and kikiam just until cooked. Push to one side of the pan. 2. Add garlic and onions. Saute until onions are almost translucent. 3. Add dried anchovies. Saute for about 3 minutes. 4. Add chicken broth, fish sauce and oyster sauce. Mix well. Bring to a boil. Add salt and pepper to suit your taste. 5. Add soaked jiangxi vermicelli. Keep on tossing in the sauce until almost cooked. 6. Add vegetables. Mix well with noodles. 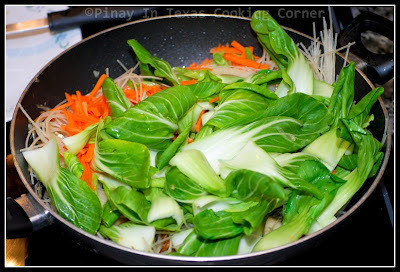 Keep on tossing until bok choi, green beans and carrots are crisp tender. 7. Lastly, add the flaked imitation crab sticks. Mix with other ingredients until heated through. 8. Remove from heat. Transfer to a serving dish and serve. ...ღ♡Ꮣуռ էяɨռɨא♡ღ!!! Congratulations Lyn!!! You are the winner of a $25 Amazon Gift Card! I'll be sending you an email in a short while! Again, thanks so much to everyone who joined! 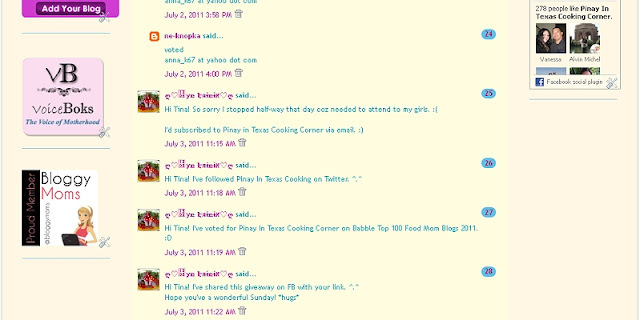 Hope you all participate again in Pinay In Texas Cooking Corner's future appreciation giveaways!!! Yum! I love fried vermicelli. This is making me hungry! Tina your rice vermicelli look really good. I know exactly what you mean about time and not being able to ans everyone .. it really is hard, especially if you sometimes have a cranky internet connection like I do. Have a wonderful vacation. 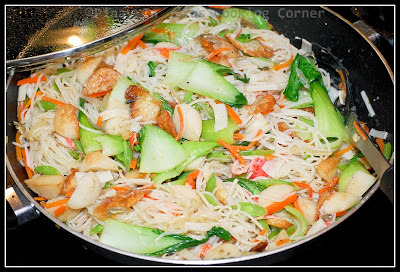 Your fried vermicelli so colourful,very nice to see and yummy! Congrats Lyn! I love this Tina! 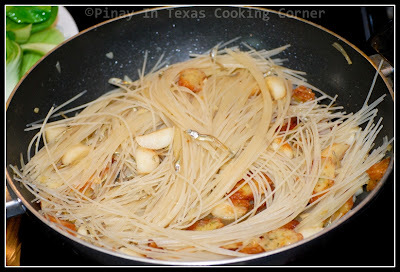 Vermicelli used to be my favorite noodle, but what happened? I totally forgot about cooking this noodle!!! This looks VERY delicious. I'm so hungry right before going to bed... Wonderful recipe. You make me hungry! !